The start of the academic semester brings with it new beginnings in the administration of the English Department. It is an honor to introduce the two faculty members who will be serving as the Interim Department Director and Interim Associate Director. Dr. Leonardo Flores, who serves as the new Interim Department Director, studied English Literature in our Department from 1988 to 1992, serving as EDSA President and student representative for 2 years and earning the Mellowes Award and a Beca Presidencial. After completing his M.A. in English at Bowling Green State University in 1994– with a thesis on Neil Gaiman’s comics– he joined the English Department as an Instructor. He was sent to the University of Maryland for his doctoral studies from 1999-2003, and has been climbing up the ranks since then, including a 4-year appointment as Associate Dean of Assessment and Educational Technologies. His research in electronic literature led him to create I ♥ E-Poetry, a scholarly blog in which he and others review different types of electronic literature. Dr. Flores teaches a variety of classes which he redesigns and focuses around digital media. He particularly enjoys teaching the Digital Creative Writing and DH Internship courses, the latter because it gives him the opportunity to work alongside students. 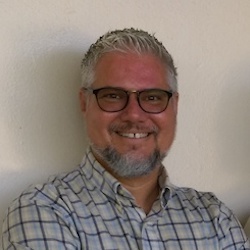 As the Interim Director, Dr. Flores explained he is essentially “behind the steering wheel,”, overseeing the functioning of the entire English Department. His work includes the supervision of faculty members, staff, and graduate teaching assistants. 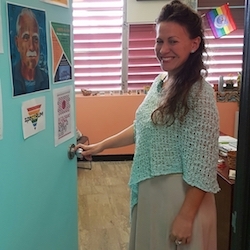 Dr. Mary Sefranek, who serves as the new Interim Associate Director, began working in el Colegio in 2006 after completing her doctorate’s degree in English Education with specialization in Bilingual/Bicultural Education from Teachers College, Columbia University. She began as an Assistant Professor teaching Intermediate English (INGL 3103 and 3104) and serving as the Coordinator for the Intermediate English courses through 2010. From 2006-2009, she also conducted educational research in an elementary public school in San Sebastián, funded by the Faculty of Arts and Sciences and the National Council of Teachers of English. Since 2012, as instructor of INGL 6996 (University Teaching Development), she has played a key role in the professional development and instruction of graduate students who receive teaching assistantships to instruct over 2000 undergraduates each semester. Moreover, after the retirement of Dr. Judith Casey in 2013, she commenced teaching and coordinating the second series in the Basic English sequence of courses (INGL 3201 and 3202). She has also routinely organized conferences for the Department of English, the larger Colegio community, and the public – most recently in 2015 with Luchas de Antes, Ahora y…¿Siempre? Lxs ex-prisionerxs puertorriqueñxs y su legado en las generaciones nuevas and, since 2010, a yearly panel for and by undergraduate students, “Apply for your Future: Learning the Ins and Outs of the Application Process for Internships, Scholarships, and Other Professional Opportunities.” As the Interim Associate Director, she will focus primarily on administrative issues with undergraduate students. 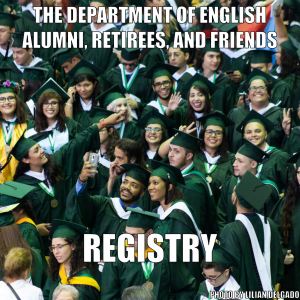 specifically those related to enrollment, orientation, on-going advising, and graduation. She also aims to keep students informed about the numerous on campus and local resources that exist to support not only their academic enrichment, but also their professional growth and their emotional and physical well-being. Both professors show notable commitment to finding innovative ways of working with faculty and students, and will undoubtedly work with great dedication so that the English Department continues to shine.